because it has two purples and two ovals. Remember, you only ever want one or three of a feature. I know, I know, it sounds really complicated, but trust me, it’s SUPER EASY to play once you get into it and FUN. I first learned to play it as a card game in about five minutes. With an iPhone and no need to shuffle, I’m sure I would’ve learned even faster. The touch interface makes it trivial to zip through games. It’s incredibly replayable, and there are a number of options you can use to mix it up, including timed and puzzle versions. You also always have the choice between a basic or advance setting, for when you’re feeling brain dead or want more of a challenge. Purists will likely be frustrated that there isn’t a game option to play through the whole deck. There is also always a set to be found, so you’ll never have the option to deal more manually. They had a setting to turn on hints, but I couldn’t figure out how the hint system worked, and like the original card game, SET is still very tough for the colorblind. I think the biggest issue SET faces is that there is no option to play against others, only the clock. It’s a fairly minor gripe, but I remember the rush of snatching a set out from under the noses of my friends and that’s a feature definitely lacking in the SET app. It would be nice to see a future version that allows for competitive play, but otherwise, this is a really solid port. The graphics are as clean as you could hope for, the interface is great, and navigating the settings and options is a snap. 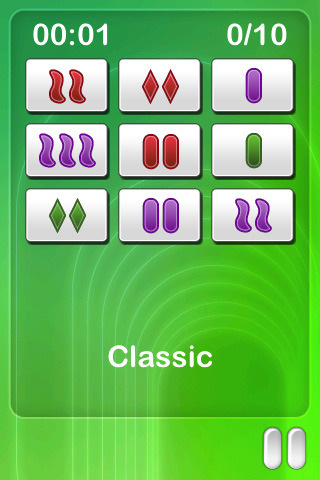 If you enjoyed the card game or are just looking for a fun brain teaser, I would highly recommend checking SET out. AppSafari review of SET was written by Tracy Yonemoto on March 29th, 2010 and categorized under App Store, Featured, Fun, Games, Puzzler. Page viewed 3309 times, 1 so far today. Need help on using these apps? Please read the Help Page.